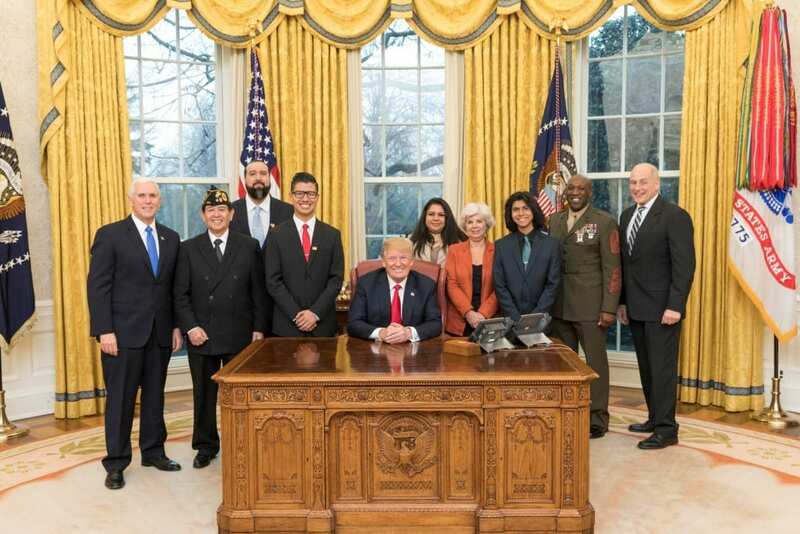 The Salcido Affair - Jewish War Veterans of the U.S.A.
Official White House Photo by Shealah Craighead In the Oval Office, from left, are Vice President Mike Pence, Jose Reyes, Vincent Quiñonez (Victor’s father, a Marine & Afghanistan vet), Victor Quiñonez, President Donald Trump, Karen Rodriquez (Victor’s mother), Sandi Reyes, Anthony Quiñonez (Victor’s younger brother), Sergeant Major of the Marine Corps Ronald Green, and White House Chief-of-Staff Gen. John Kelly. 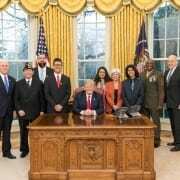 Jose Luis Reyes, a Vietnam combat-tested Marine and member of Dallas’ Jewish War Veterans Post 256, recently experienced a whirlwind trip to Washington, DC and the White House. The events leading-up to a meeting in the Oval Office began with an incident involving his grand- nephew, Victor Quiñonez, a high school student in Pico Rivera, a rural community southeast of Los Angeles. Victor covertly recorded the tirade on his phone; a relative later posted it to social media, where it went viral almost immediately. The “Salcido Incident” caught the attention and ire of veteran groups throughout the country, and especially that of John Kelly, the retired four-star Marine general and Chief of Staff to President Donald Trump. Kelly promptly extended an invitation to Victor and his family to visit the White House and Pentagon as a token of his appreciation for Victor’s resolve and patriotism, as well as to honor Jose’s service and leadership by example. Since the incident occurred, we found out that Salcido has since been fired by the school district. In a report released on April 18th, Mr. Salcido was found to follow a pattern of bullying where his students were white, asian, pro-military, christian or gay. In addition, pornographic pictures were found on his work computer. However, Mr. Salcido is still currently serving as a Councilman for the City of Pico Rivera, but there is a recall petition in progress. On Feb. 23, Victor and Jose, accompanied by family members, toured the White House, escorted by Vice President Mike Pence and Sergeant Major of the Marine Corps Ronald Green. The Sergeant Major offered to be Victor’s personal recruiter when he graduates. Highlighting their visit was a stop in the Oval Office for a chat and photo opportunity with President Trump. As a sign of pride in his Jewish War Veterans’ membership, Jose wore his Post cap throughout the day’s activities, even in the Oval Office. Afterward, the group received a VIP tour of the Pentagon and visited the nearby National Museum of American Jewish Military History, co-located with JWV’s National Headquarters. On March 25, Jose, shared the experience with his fellow JWV Post 256 members, the post Auxiliary, and guests at the group’s monthly lox and bagel breakfast at the Aaron Family JCC.